Breeding Great Pyrenees: Does Job Matter? I’m sure everyone has heard this phrase encouraging people to rescue rather than purchase dogs from breeders or pet stores. I’m going to say something controversial–I don’t agree with it. Do I think there is a rescue dog out there for the majority of people? Yes. Do I think there are far too many people breeding? Yes. Do I push adoption over the purchasing of dogs? Yes. If I’m saying yes to all of these questions, then why can’t I get behind “adopt don’t shop”? To me, the answer is simple: Without people responsibly breeding Great Pyrenees, the breed I love and am extremely passionate about would cease to exist. Without responsible breeders, we’re still left with people who aren’t careful with intact dogs. We’re left with people who want their kids to experience the miracle of birth. We’re left with people breeding solely for money. We’re left with people who have no regard for the breed standard or breeding healthy puppies. When breeding Great Pyrenees, responsible breeders work to better the breed. They breed to eliminate breed-specific health issues. They breed for strong conformation and healthy hips and joints. They breed for temperament. They breed to maintain the breed’s integrity. They work toward all of these goals simultaneously. Show dog parents make good show dog puppies and working parents make good working puppies, right? Unfortunately, breeding Great Pyrenees is not that simple. While there is a better chance that pyrs from working lines will produce good livestock guardian dogs, there’s no guarantee. LGD lines can produce fantastic show dogs and show dog lines can produce amazing LGDs. Let’s take a step back. You cannot accurately predict the look or temperament of a mixed breed puppy. That’s why these popular designer breeds have so many different looks and personalities. You don’t get to pick and choose the traits you want–genetics aren’t that simple. If you see Great Pyrenees / Anatolian Shepherd mix puppies for sale, you can’t guarantee the traits your new puppy will carry. This is especially true when the puppies are between six and seven weeks, which is when irresponsible breeders often rehome their puppies. It’s much more predictable to have two LGDs of different breeds than roll the dice with a mix, regardless of what their lines are. When it comes to responsibly breeding Great Pyrenees, people tend to fall to one side or the other on this topic. Some people think that the only people that breed LGDs are the careless people who just let their working dogs breed. It’s rare that two working dogs at the same farm will possess the traits to balance each other and elevate the breed. I wish I was making this up, but I see far too many littermates producing a litter of their own in this type of environment. That’s one of the quickest ways to start a genetic nightmare. Responsible breeders of livestock guardian dogs won’t let their puppies go as soon as they’re weaned (which can be as early as 5 weeks, depending on the mama). *Quotes have been edited for grammar and clarity. Great Pyrenees obsessed. Red wine lover. Thrives on all things Pyrenees. This post is terrific Kelsie! 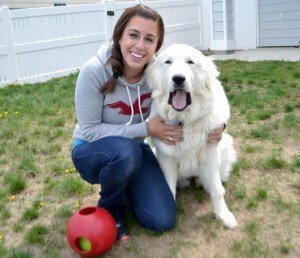 Thank you so much for sharing your expertise on Great Pyrenees and LGD’s breeding. I found myself standing and cheering when you brought up mixed breed designer dogs. Funny how the Anatolian gets mixed with so many breeds in an effort to get a superior version of that breed. American Mastiffs are just that – a mix of Mastiff and Anatolian – “designed” to have all the awesomeness of a Mastiff, but without the drool. Are you kidding me?! Advertising a litter of puppies as LGD’s takes nothing more than an ad on Craig’s List and those puppies will have a buyer. The lack of education on behalf of those buyers is the problem. Somehow, someway, we need to reach THOSE people because where there is no demand, there will be no more supply. So, I have a perhaps tangential question. I rescued a puppy who has turned out to be a truly remarkable dog. He is 50% GSD, 30% Great Pyrenees, 8% Husky, 7% Collie, according to the Embark DNA test, and he has zero genetic issues. I double-checked to make sure they had a good sample, since that result seemed to be hard to believe. They confirmed he’s totally clean. He is just about a year now, is doing great in training. The thing is: he is show-stoppingly beautiful. People stop their cars to yell out the window how beautiful he is. And he has absolutely the sweetest personality—makes little dogs feel comfortable, big dogs have fun playing, aggressive dogs seem to mellow a bit, and I’ve been told over and over by folks that “their dog usually doesn’t like big dogs…” but they love him. People stand in line on our walks just to pet him. This guy is an exquisite gem. My vet had me hold off fixing him til he reached 1-2 years, since he was so undernourished when I adopted him, and he’s got the large breed genes. I know I’m a proud dog mom, but this guy seems like he should make more critters like him. Please don’t jump on me, I know we should spay and neuter (remember, I rescued him! I know!). But his genes, in terms of work, beauty and personality, seem to be what people want in a dog. Thoughts? Your dog and his great personality are the results of “luck of the draw”. Who knows what his littermates were like? They might have been the polar opposite of him. This is why a pedigree is so valuable, as is a responsible breeder. They could tell you all about his parents, uncles, grandparents, siblings. There is NO predictability in your wonderful dog’s genetics as it stands. Enjoy him, pat yourself on the back for being so lucky to have him (and for being a good owner which is part of it too!) and neuter him at an appropriate time. I never thought of that! I do adopt my Pyrs from a rescue, but they are full, and more than likely came from a breeder, and the family couldn’t maintain or another reason. That’s for helping me see another side! AHHH, you’ve stumbled upon one of the biggest conundrums of being a breeder. We have all at some point in our careers had that one in a million dog that we just had to be sure he was duplicated, but I’ll tell you the truth, it is INSANELY hard to do. As Kelsie mentioned in her article, genetics are a capricious thing, you might get some of the traits you are looking for, but miss others. Other than cloning him, (which trust me if the technology was there and reliable, we’d use it! ), your once in a lifetime dog will probably remain a one of a kind so enjoy him while you have him. Lavish him with the love and attention this beautiful creature deserves and don’t be too bent on trying to make little copies of him. That combination of genes that resulted in the wonder that he is may never occur again! I have 1 of each. My 3 year old female was a rescue at 8 weeks from a local shelter. I think I must have picked her up at a foster’s home. I found the pic on Hoobly & called on her. I spoke at length with the individual & drove to pick her up. The lady met me outside of her home. Said she had taken the puppy for a walk, that was why they were outside. She handed me the puppy & the rescue paperwork & I handed her $300.00. I was told she was Pyr & Golden & that she & her sister came from an Amish farm down the road. My 2nd Pyr was a purchase from a private breeder on the other side of my state. I met him & the puppies & the mother. I chose my pup & paid $600.00. I was told the father was struck by a car a few weeks prior. Both my dogs are beautiful, friendly, & gentle. My 3 yr old has bilateral hip dysplasia, my 1 yr old male has no apparent issues. Neither person provided any info on Pyrs or their quirks. I obtained my own knowledge on the breed after getting my 1st. There was a Huge learning curve. With the number of Posts about Pyrs with health issues, seizures, premature deaths, etc. I think there is a lot of poor breeding out there. Shelter dogs often come with multiple issues, both behavioral & medical. It takes a lot of patience, money, & emotional commitment to adopt or purchase one of these dogs. It’s not for the faint of heart. I firmly believe in adoption when ever possible. Either way, it requires commitment. These dogs have big hearts. They are not disposable items to discard when they don’t fit. Research any pet & obtain as much info as possible before you decide. I was lucky that both of my dogs are healthy, others have not been. Wether it is a shelter dog or a breeder’s dog the dog in the right hands is a wonderful pet. Responsibility is the key . I still stand behind adopting a shelter or rescue. When adopting you are saving the lives of two because room is being made for another . The number of animals that are euthanized a day is overwhelming and heartbreaking. I have a great pyrenees thst we adopted from a rescue and 2 separate DNA tests from 2 separate samples and separate manufactures results were 97 % Great Pyrenees. She is such a wonderful addition to our family. No matter what decision you go with without proper training it wont matter . Again I am the outsider I still believe in saving an animal from death row . Too many animals are dying that deserve a second chance. Totally agree with this post. My story takes it a small step forward. My husband and I adopted brothers at about 6 weeks old from a shelter. They were in terrible shape with worms, fleas, flu, etc. and the first month alone cost us well over $1500. By month 2 we decided to have their DNA done just for a clue of what to expect. And while I understand test variance, I think this blood work is right on target. Both results show 7/8 Great Pyranese and 1/8 Labrador. Apparently breeding Pyradors is big in Kentucky and Tennessee. Who knew? We believe these boys were thrown away because the black/brown gene of the lab came through. Breeding works for everyone – When it’s done responsibly! And when it’s not done properly it’s only the pup that’s hurt! I can’t imagine a real breeder throwing away any pup any more than I could imagine not adopting the two of them together. Our last dog was a border collie. The absolute best dog ever (after the first 2 years). We’re not sure what to expect with these guys. And I’m thankful for your site and the info given. So far they are 1 yr old, great big, stubborn babies. They hate the heat but can’t wait to go out when it’s raining. They’ve eaten the wallpaper, butterfly bush and the wheel well of my SUV. They know how to sit, come, give, and leave-it but I can’t break the jumping on people as they come in the door. My yard has 13 huge holes in it and they pull the bricks out of the landscaping but my god they are the sweetest, most loving babies I’ve ever had. Back to breeding, I don’t expect these guys to be LGD’s. And I’m not sure if the vets right when he says they will grow up to be the “most expensive, fluffiest bath mats” I’ve ever owned. But unlike the breeder, I accept the, for who they are. I use the Adopt Don’t Shop statement and hashtag a lot when I’m promoting animal welfare topics which I do a lot. However, my stance is always to ask people to consider adoption whenever possible but I don’t judge at all those who buy a pet from a breeder. Many people don’t realize there are breed specific rescues out there, they think a breeder is the one and only option to find the dog breed of their dreams. People surrender dogs for many reasons, some valid and some not so valid. I have both a shelter dog, and a purebred dog I purchased. I definitely do not agree that responsible, reputable breeding should end – that would be tragic in my opinion because, as you said, it would eventually make purebred dogs extinct. I think it would be a tragedy to lose those dogs it took years and work to create. Just because there are a bunch of bad apples who decide to breed strictly for profit and not to sustain and improve the breed, doesn’t mean that all breeding should end. Bad breeders and irresponsible owners who don’t properly care for their pets and dump them at shelters like trash have caused overpopulation in shelters and ruined it for everyone. I understand both sides if this controversy ….. I have a daughter with special needs, she is non vocal. For my situation, I wanted a family pet that I can trust … no food aggression, lay back, easy going and no behavior issues. I’ve had Golden Retrievers and now we have our first Great Pyrenees …… all and I mean all have been wonderful dogs and perfect for our family. I talked to the bteeders and explain our needs …… they chose our puppy for us and this last time we adopted a 9 month old Great Pyr that the breeder had. I can leave my Great Pyr alone in the room with my daughter and not worry one bit. She’s been perfect for our family situation and I can’t tell you how much that means to me ….. I am a single parent with 2 young adult children … my daughter lives with me still and always will …. for me, I can’t chance adopting and not knowing what I’ll end up with and/or serious issues down the line. Kelsie, though I have read this many many times as I feel it is absolutely one of The Best written articles written as a voice for our beloved breed, I felt the need to refresh. I am a breeder, and having my first litter, it is constantly a struggle to explain and help people understand the difference in “just a breeder” (dare I say “backyard breeder? ), vs a driven, responsible, advocate for breed standard, health clearances and a thriving lifestyle of the Pyrs in their care? It is no lie, it is overwhelmingly expensive getting all the health clearances, OFA certifications, absolute proper nutrition, proper environment/lifestyle that they must thrive in and so desire. But, imo, if I am going to breed for the greater good of the breed, I will spare no cost in doing just that. I love love love this breed; my pyrs mean everything to me, are a crucial part of our sheep farm and I just could not imagine life without them, much less, being the means to allowing the creation of offspring anything less than all the best I can do for them. Thank you for your insight. I totally get you…& your love for your darlings.